Chancellor reveals devolution deal Jump to media player The government hails a new deal to devolve more power and more money to the North East as a "game-changer". Health devolution for Greater Manchester Jump to media player Greater Manchester is to become the first region in England to get full control of health spending. 'Logical' for more Welsh devolution Jump to media player It is "so logical" for Wales to be part of greater devolution as it moves forward in the UK, the deputy prime minister says. Lack of 'balance' in devolution Jump to media player Former Welsh Secretary Alun Michael says the lack of devolution to the English regions has left the United Kingdom unbalanced. The government has hailed a new deal to devolve more power and money to the North East as a "game-changer". There will also be a combined total of £45m of investment for the North East, through both mayors, every year. 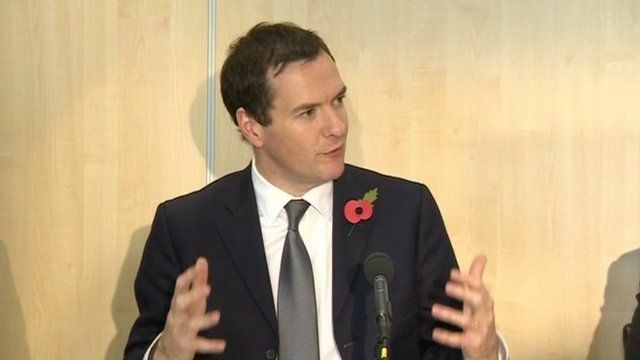 Mr Osborne launched the new deal with Northern Powerhouse Minister James Wharton.